This case involves a challenge to various surveillance and investigative practices directed at political organizations by the New York City Police Department. The case began as a challenge to various police practices that involved the maintenance of dossiers on political activists and the use of various undercover and surveillance techniques to monitor the activities of political organizations and individuals. The case was settled with a consent decree entered in 1985, in which the Police Department was prohibited from investigating political and religious organizations and groups unless there was "specific information" that the group was linked to a crime that had been committed or was about to be committed. 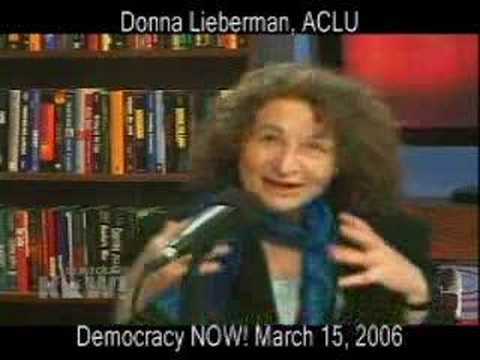 NYCLU Executive Director Donna Lieberman explains the Handschu case. The decree also established a system of record-keeping and procedures for approval of investigations by a three-member body, called the Handschu Authority. The system was designed to create a "paper trail" in order to ensure against abuse. In September 2002, the NYPD moved to modify the 1985 consent decree upon the claim that the decree impeded the Police Department's efforts to investigate potential terrorism. In a decision rendered on Feb. 11, 2003, the District Court approved a modification of the decree so long as the Police Department developed new guidelines that would be consistent with those developed by the U.S. Department of Justice for investigations conducted by the F.B.I. The Police Department's modified guidelines were accepted by the District Court on April 8, 2003. The modified guidelines were initially not included within the court's decree. However, during anti-war demonstrations in February and March 2003, the NYPD employed certain "debriefing" practices in which arrested protesters were subjected to inappropriate interrogation into their past political associations. The class counsel then moved to amend the April 8, 2003 decision so as to specifically incorporate the modified guidelines into the court's order and judgment. The court granted the class counsel's motion and claimed that "operational ignorance" on the part of the NYPD's top officials did not excuse the actions of its officers. The photographic and video surveillance practices conducted by the NYPD during the Republican National Convention have raised new issues in this case. On Nov. 28, 2005, the plaintiffs filed a motion to enjoin enforcement of NYPD Interim Order 47. Order 47 establishes procedures and guidelines for the Police Department's use of photographic and video equipment. The plaintiffs argued that Order 47 is incompatible with NYPD guidelines. In addition, class counsel sought injunctive relief on the grounds that Order 47 violated the plaintiffs' First Amendment rights and prior Handschu judgments. However, on Feb. 15, 2007, the District Court ruled in favor of the defendants. The court rejected class counsel's request for an order enjoining the enforcement of Interim Order 47 on the grounds that the investigations in the question are not politically motivated. The court also stated that, since Order 47 did not constitute a First Amendment violation, it would not grant the plaintiffs' injunctive relief. In June 2007, the court further modified its February decision on the enforceability of the consent decree, requiring that plaintiffs show a systemic pattern of violations before the court will enjoin any Police Department policy. On Feb. 27, 2008, the court ordered the NYPD to provide plaintiffs records of its videotaping practices. Plaintiffs sought production of these documents to help determine if the NYPD had been routinely videotaping political demonstrations in the absence of any reason to believe that criminal activity had occurred was about to occur.